Personnel from the US Centers for Disease Control and Prevention who have been stationed in the Democratic of Congo to help control the ongoing Ebola outbreak have been pulled back from the worst impacted areas due to safety concerns, a US government official familiar with the situation told CNN Monday. "They are not in any hot spots," the official said. Since this most recent outbreak began on August 1, there have been 211 cases of Ebola, including 135 deaths as of Sunday, WHO spokesman Tarik Jasarevic confirmed. Fifty-five patients have recovered from the illness. He said there has been a recent increase in cases because of "challenges faced by the response team." "For a couple of days we were not able to function really, and in the last couple of weeks we could not function at 100%," said Jasarevic. Challenges include a spike in violence that led to a change in location for CDC responders. "The recent spike in violent incidents makes the response more difficult, and increases the risk of spread not only in the DRC but also in neighbouring countries" Jasarevic stated in an email. The WHO will hold an emergency committee meeting this Wednesday in Geneva "to ascertain whether the outbreak constitutes a public health emergency of international concern, and what recommendations should be made to manage the outbreak," according to an announcement released Monday. Two weeks ago, Dr. Tedros Adhanom Ghebreyesus, director-general of WHO, said at a UN Security Council meeting that WHO had raised its risk assessment of regional spread from "high" to "very high." However, at that time, the risk of international spread outside Africa was regarded as "low," he said: "We are very concerned about the potential for the virus to spread into Uganda, but also into Rwanda, South Sudan and Burundi. We are working very closely with those governments on operational readiness for Ebola." North Kivu province is the epicenter of the current outbreak, though some cases have been reported in neighboring Ituri province, according to WHO. The two provinces, which are among the most populated in the nation, border Uganda, Rwanda and South Sudan. On average, Ebola -- which causes fever, severe headache and in some cases hemorrhaging -- kills about half of those infected, but case fatality rates in individual outbreaks have varied from 25% to 90%. Along with the spread of deadly Ebola, Congo is also experiencing a long-term humanitarian crisis that includes intermittent armed conflict, according to WHO. WHO has estimated that more than one million refugees and internally displaced people are in North Kivu and Ituri, and their movement through and out of the provinces is a potential risk factor for the spread of Ebola. Dr. Peter Salama, WHO's deputy director-general of emergency preparedness and response, stated in a tweet posted Saturday that with each violent incident in northeast Congo, the community loses trust and "more cases and contacts are lost to follow-up." This "vicious cycle" increases the risk of the disease spreading, he added. Salama also described in a tweet that the "toxic mix of factors driving the increasing force of infection." These include safety concerns which limited health workers' access to affected communities and families, "chronic mistrust in the community after years of conflict," and "fear and rumours" about Ebola. 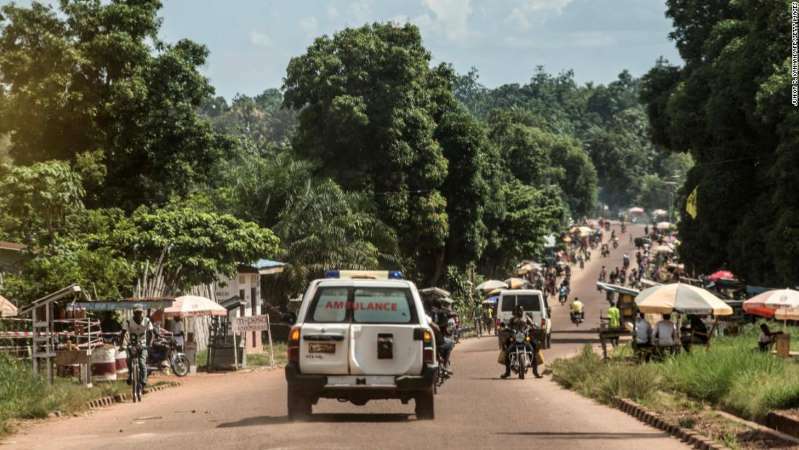 Last week, for example, community members stole the body of a woman who died at the Ebola Treatment Center on her way to the cemetery, according to a bulletin posted Thursday by the DRC's Ministry of Health. Previously, the woman's family had requested some concessions with regard to her burial, including that the hearse be driven by one of their acquaintances and that five family members be allowed to carry the casket while wearing personal protective equipment. However, as the procession made its way to the cemetery, the driver suddenly changed course. Several young people "violently chased the police and kept the body with them," according to the bulletin. Later, "panicking and realizing their mistake," they allowed the deceased to be delivered to the cemetery. The following day, several family members volunteered to get vaccinated and apologies were made to the response team. "Young people in the neighborhood promised that they would not let such a situation happen again in their neighborhood," according to the bulletin. This is the second outbreak in Congo this year, according to WHO. A previous outbreak began in May and ended in July; it affected a western region of the country, where 54 cases were recorded, including 33 deaths. Beginning with the 1976 discovery of Ebola in an area that is now the Democratic Republic of Congo, the country has experienced 10 outbreaks, including this year's outbreaks.